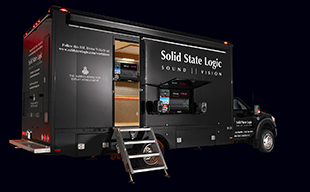 Solid State Logic will showcase for the first time in Europe its new V6 Software for the industry-leading C100 HDS Digital Broadcast Console at IBC 2013 (Hall 8, Stand D.83). Demonstrating ongoing development of the C100 HDS, the V6 Software release offers new features that introduce significant workflow efficiencies for operators while reaffirming SSLs commitment to constantly evolve the platform to meet the emerging needs of broadcasters. Highlights of the V6 upgrade include Function Key Macros, a feature which reduces the number of physical actions required to achieve specific tasks by allowing multiple two state console switching functions to be grouped as a Macro and then actioned via soft keys, GPIs and fader functions. Another feature is HyperRoute, which makes the already superior SSL routing system even better. The C100 routing system uniquely allows operators to use a versatile source and destination group-based approach with operation from the actual control surface, rather than a separate computer. HyperRoute introduces an additional destination-based routing structure which has the benefit of displaying destination source assignments without having to re-navigate through the source>destination path. The consoles new Assignable Delay Modules make integrating a wider range of external sources into live-to-air feeds quicker and easier. A total of 32 of the 64 available delays can now be routed anywhere, including Aux and Monitor inserts, or external I/O destinations that pick up internal or external sources as inputs. A new Control Surface Screen Saver extends the operational life of the console control surface by switching off all of the OLED displays and screens when not in use. V6 Software for C100 HDS is available now.